Participants with at least 3 risk factors had the greatest risk reduction with bezlotoxumab. Photo Credit: CDC/Dr Gilda Jones. 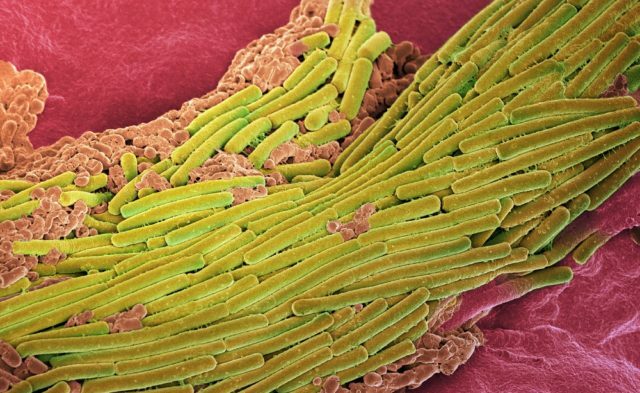 Bezlotoxumab may reduce recurrent Clostridium difficile (rCDI) infection in patients with ≥3 identified risk factors, according to research published in Clinical Infectious Diseases. Approximately 25% of all patients with CDI will suffer from rCDI. Several factors have been associated with rCDI, such as age ≥65 years, compromised immunity, severe CDI, prior CDI episode or episodes, and infection with the BI/NAP1/027 strain. Furthermore, previous work from 2 global, phase 3 trials, (MODIFY I, ClinicalTrials.gov identifier: NCT01241552; and MODIFY II, ClinicalTrials.gov identifier: NCT01513239) demonstrated that bezlotoxumab significantly reduced rCDI compared with placebo. Therefore, to further investigate which populations suffering from the associated risk factors would most benefit from treatment, pooled MODIFY trials data were used to assess efficacy of bezlotoxumab in the subgroups. A total of 1554 participants were enrolled: 781 received bezlotoxumab and 773 received placebo. Among participants who had ≥1 risk factor, those treated with bezlotoxumab reported fewer rCDI compared with placebo (21.2% vs 37.2%, respectively; difference, −15.9; 95% CI, −21.6 to −10.2). The absolute reduction was −14.2%, −14.2%, and −24.8% for those with 1, 2, and ≥3 risk factors, respectively (relative reduction: −45.3%, −34.5%, and −53.9%). Conversely, the proportion of rCDI was similar between the treatment groups among participants with no risk factors (bezlotoxumab, 18.8% vs placebo, 20.9%; difference, −2.1; 95% CI, −11.1 to 6.9). Investigators concluded that “risk factors prespecified in the MODIFY statistical analysis plan are appropriate to identify patients who are at high risk for rCDI” and “participants with at least 3 risk factors appear to have the greatest risk reduction with bezlotoxumab.” However, patients with only 1 factor may also benefit from treatment. The results must be considered preliminary, however, because other risk factors for rCDI exist that were not included, and their inclusion may affect results. Furthermore, most of the analysis was done post hoc, and the study was not powered for statistical significance for subgroup analyses.